Get to the goal by jumping on the panels before your opponent! It's FREE only for now! "Panels jump!" is a simple game that anyone can play. 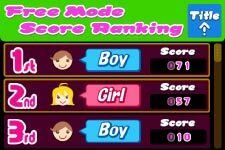 * Two-player game "Versus Mode"
First each player chooses from the characters "Boy" and "Girl". The players start from the opposite sides of the screen, and lead the chosen character to the opposite end. Red and blue panels are running across the screen. 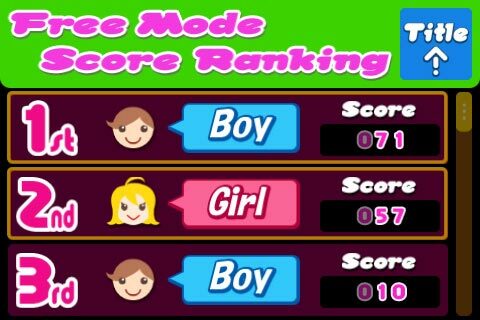 "Boy" must jump on to blue panels, and "Girl" must jump on to red panel. Tap on the jump button to let your character jump across. The player who got to the opposite end first wins. If you jump on to the wrong color panel, or jump at the place where the panels don't exist, your character falls and returns back to the start position. The panels will run faster when the character jumps over the panel. 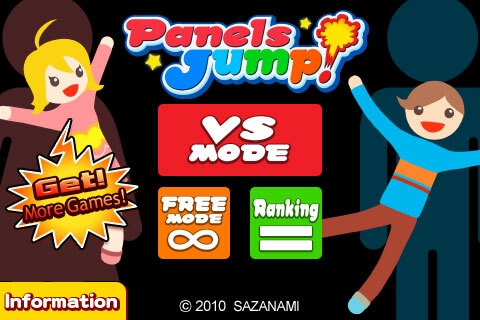 You can let the panel run faster to make it harder for your opponent to jump across. However, the panel speed returns back to normal when your character falls, which gives the advantage to your opponent. You can set the handicap to each player so the beginner player can play against advanced players. Select the Handicap 0-4 in the battle menu. Larger value makes the panel smaller and faster so that it is more difficult to jump across. 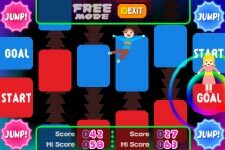 * One or two-player game "Free Mode"
The controls are the same as the "Versus Mode". The players tap on their jump button and lead their character to the end. 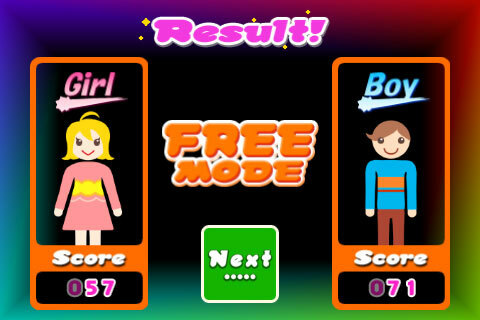 In "Free Mode", you obtain a score each time you jump across to the next panel. However, your score resets to 0 when you miss. Your character will return back to the start when you reach to the end, and so you can continue playing to aim the high score. 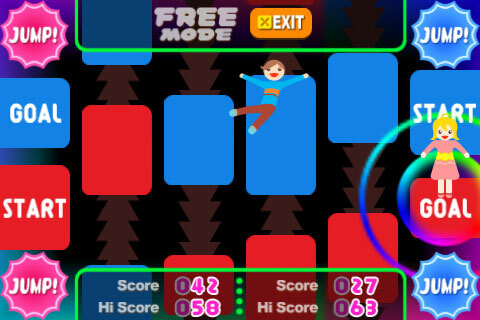 Tap "EXIT" button to finish the "Free Mode", and shift to the ranking screen. You can start the game anytime by tapping "Start!" button. Two-player game is also possible as well as one-player game. The playing style is up to you.